Although it’s 2017, fake texting still remains a popular method of scamming, pranking, and even scaring people. Fraudsters and pranksters alike use the old fake text trick to gather valuable information from innocent victims. Because of this, we become less trustworthy of unfamiliar numbers when they call – and as a result, we miss important updates from doctors, schools, airlines, and job offers. What is Fake SMS Detector? In order to stop SMS bullying and harassments, we’ve searched through Google Play to find a useful app that actually works. That’s how we’ve encountered with the Fake SMS Detector app – an Android tool that can detect fake text messages on any mobile device. It is easy to use, designed with smooth UI and requires only Android 5.0 and up. If you’re being SMS bullied and harassed, Fake SMS Detector is now here to help you out. It allows you to detect fake text messages on any Android device, by doing an in-depth real-time chat check. How does it work? Let’s suppose that your friend is showing you a SMS under your name or number in his/her device which you never sent. To prove that it is not sent from your number and to test the app, install it on his/her device and let it do all the needed work. The app will show that you haven’t sent the text. Amazing, right? Additionally, you will receive instant notifications whenever you receive a fake SMS. 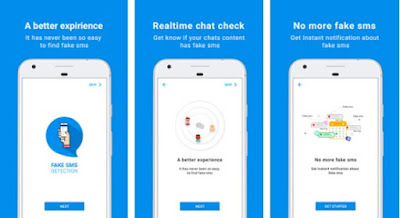 It has never been so easy to detect and find fake texts! Enjoy a better Android experience by downloading this useful app for free from Google Play.